Edinburgh has become an oasis for the Hen Parties, not only due to fantastic food, clubs and in being a stunning location but because outdoor experiences are on your doorstep. Those attractions are so varied that will satisfy even the most demanding bride and her lovely bridesmaids. That is why this time we want to present the list of the most amazing adventures to do in Edinburgh – they will make you shudder with excitement. Our first recommendation is Canyoning and for good reason! Canyoning is an undoubtedly thrilling experience for groups of active and adventurous ladies! This spectacular outdoor activity will have you and your squad literally jumping off cliffs and abseiling down waterfalls. Forget the excitement of “getting married”, canyoning will have your heart beating out your chest all day. For more information about what is canyoning check out our “definitive guide to canyoning” equally if you want to hear about other peoples coasteering experiences read about “Gemma’s first canyoning adventure”. Coasteering is option number two in our list of hen party adventures. If you and your crew are of a mixed ability, but still looking to add a splash of excitement to your day, this is the acitvity for you. Would you like to feel like a mermaid? We use the beautiful Shell Bay for our hen and stag coasteering adventures because it is awesome and only 1 hour 10 from Edinburgh. During this experience we will cliff jump, swim in the sea and explore caves. A great chance to have an adventure with the bunch of your beloved girls. For more information about what is coasteering check out our “What is coasteering blog?” equally if you want to hear about other peoples coasteering experiences read about “Jen’s first coasteering adventure”. 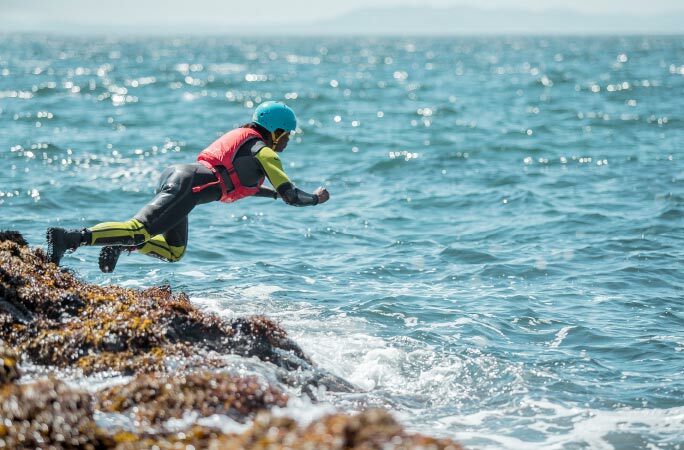 Remember if you just can’t choose if you want to go coasteering or canyoning first, our “Canyoning V Coasteering” blog should help you make your mind up. For those who like an outdoor vibe, however, want to minimise the amount of falling through the air; canoeing is the adventure for you. This is an ideal way to explore the fantastic River Tweed stylishly. Perfect activity for those ladies who do not want to get their hair wet, but like the feeling of being a voyager. The views of the Tweed Valley are fantastic, and the waterways will astonish you with its beauty. What more you can ask for on the perfect day out? Additionally, we want to mention that we also provide transport, so we collect you from your hotel and take to the adventure of your life. As an extra, we can prepare a delicious and freshly made breakfast or lunch for all of you so you can enjoy your day out without any worries; thus no one will stay peckish. For those who planned to spend a few days in Edinburgh, we have an excellent offer of 20% off if you book a second full day activity. All that only with Intrepidus Outdoors! To conclude, if you’re planning a hen party for your friend to Edinburgh, will welcome you with open arms and invite you to a wonderful world full of incredible emotions, adrenaline and fantastic moments which will remain with you forever. We are an adventure tourism provider based in Edinburgh, Scotland. We specialise in great outdoor activities including hill walking, canyoning, coasteering and canoeing. We deliver these adventures to different clients which include stag and hen groups and adults visiting Edinburgh. At Intrepidus we also like to provide interesting and informative blog posts about our experiences of Edinburgh!